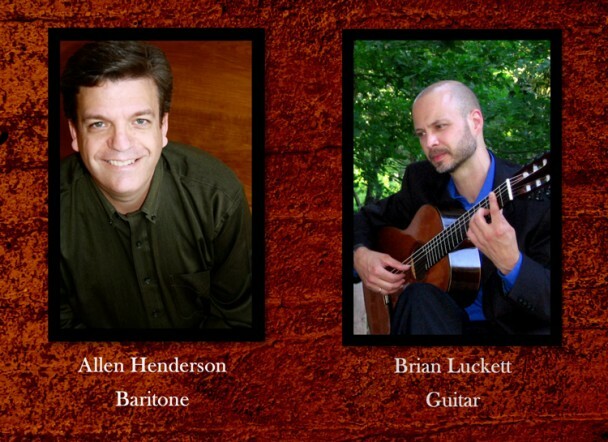 On Tuesday, Aug. 25 at 7:30 p.m., the Georgia Southern Department of Music will host a faculty recital featuring baritone Allen Henderson and guitarist Brian Luckett in the Carol A. Carter Recital Hall. Henderson, a professor of music, teaches voice and foreign language diction in the Department of Music, in addition to performing in recital and with orchestras around the country. He previously recorded both the Fink and Rutter cycles with guitarist Stanley Yates. He is also in demand as a speaker and master clinician and is executive editor of the book series So You Want to Sing…published by Rowman and Littlefield. He holds degrees from Carson Newman College, The University of Tennessee, and the College-Conservatory of Music at the University of Cincinnati. In addition, he serves as Director of Music at First Presbyterian in Statesboro and as Executive Director of the National Association of Teachers of Singing, the world’s largest professional association of voice teachers. Luckett coordinates guitar studies at Georgia Southern University and has performed in solo and chamber music recitals throughout the United States. Past performances have paired him with guitarist Eliot Fisk, flutist Nicole Chamberlain in duoATL and I Cantori choral ensemble. Brian has been featured in many programs on NPR, Minnesota Public Radio and WABE in Atlanta. He has premiered several new works for the guitar, including a concerto and several large chamber works. He earned his Bachelor’s degree from the University of Louisville’s School of Music where he was awarded the institution’s first guitar performance degree. He then received a full scholarship to pursue a Master’s degree at the University of Cincinnati’s College-Conservatory of Music with Segovia student and renowned guitar pedagogue, Clare Callahan. Brian earned a Doctor of Musical Arts degree from the University of Minnesota, where he studied with acclaimed guitarist and composer Jeffrey Van. He has recorded for Clear Note Publications and his solo CD, “Serenades of the Unicorn” was released in January 2009.